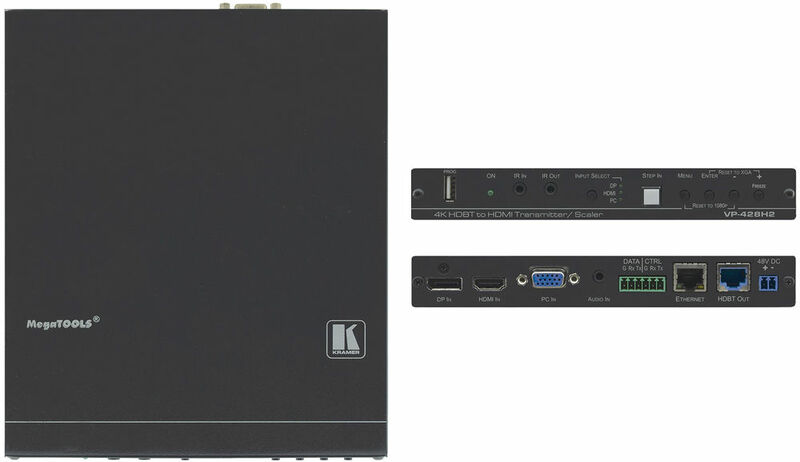 The Kramer VP-428H2 is an HDBaseT 4K transmitter/scaler with HDMI, DP and VGA inputs. VP-428H2 supports HDBaseT tunneling of Ethernet, bidirectional RS-232 and IR signals, as well as PoE to provide power to the HDBaseT receiver. It receives the selected AV signal, up-scales, down scales or bypasses the video, according to the settings selected by the user, and converts it for sending via HDBaseT, together with the tunneled data and PoE. PixPerfect™ Scaling Technology - Kramer's precision pixel mapping and high-quality scaling technology. System Range - For the HDBaseT output, extended reach of up to 100m (330ft) using Kramer recommended cables. Provides Power (PoE) on HDBaseT Output to Compatible Devices. Max. Resolutions - Input: 4K@60Hz (4:4:4); Output: 4K@60Hz (4:2:0). Built-in ProcAmp - Colour, hue, sharpness, noise, contrast and brightness are set individually for each input. Audio - Unbalanced stereo and embedded audio. HDBaseT Tunneling - Supports full HDBaseT tunneling of Ethernet and RS-232 data. Multiple Control Options - Front panel push buttons, RS-232, OSD (on-screen display) menu with front panel navigation buttons. Product Weight 0.9kg (1.9lbs) approx. Shipping Weight 1.4kg (3.2lbs) approx.